1. Prepare the weed guard by cutting about 4” of music wire. Bend the wire in half as shown. 2. 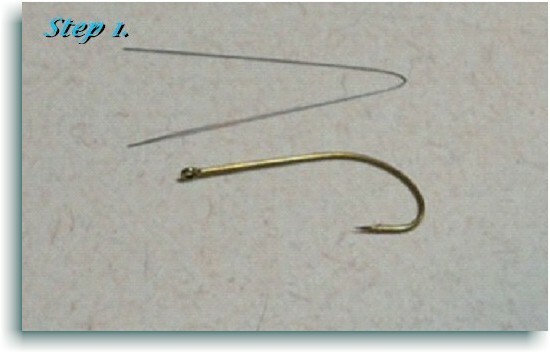 Cover hook with thread. Then tie in weed guard extending it straight forward. Estimate the length so when the weed guard is folded back toward the hook point, it’s just shy of it. Put a good coat of super glue on the thread wraps to prevent the wire from ever rotating. 3. Tie in a length of fine ribbing (I used red here) and leave it trailing out the back. Cut a strip of 1/8” sheet foam about 1/4” wide and tie it in at the back. 4. 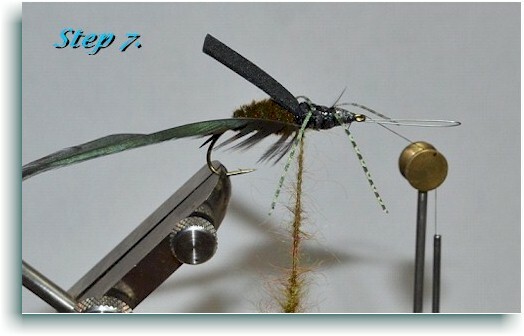 Take the thread to the front of the hook and wrap the foam forward forming the bugs shape. 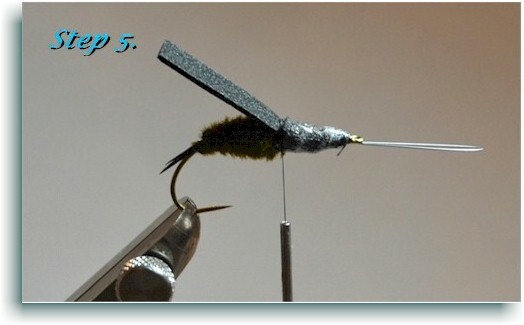 Wrap the thread lightly back to the tail and tie in the goose biot tail. This is when I coat it with a thin layer of 5 minute epoxy to seal the foam to help floatation. 7. 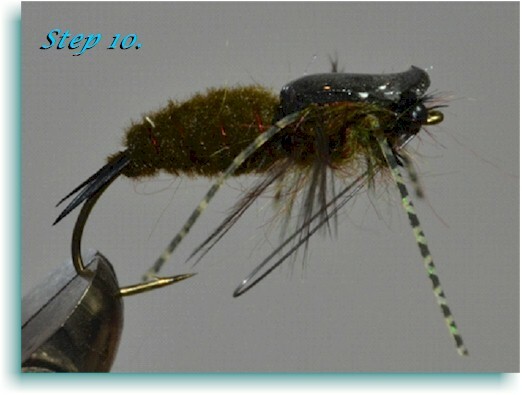 Just ahead of where you’ve tied in the wing case, tie in a saddle hackle (optional). 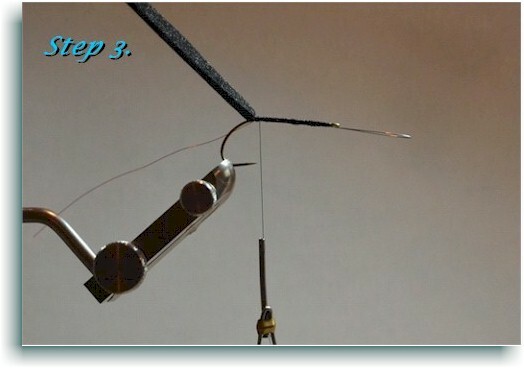 Form a dubbing loop and spin a nice shaggy dubbing line. 8. 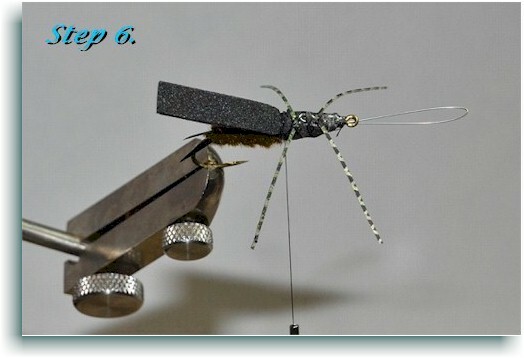 Advance the thread to 1/8” behind the hook eye and tie in XL mono eyes with figure 8 wraps and reinforce with super glue. Carefully wrap the dubbing around the rubber legs and tie off behind eyes. Palmer the hackle forward. 9. Pull the wing case forward and tie off behind eyes. Clip the tag end of the wing case. 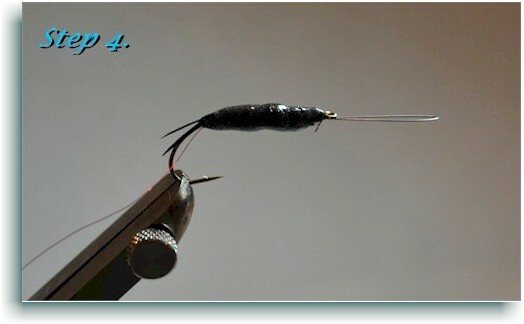 You can cut it close and bury it in thread wraps, or leave a little for a sort of “pop tab” like shown here. 10. Bend the weed guard down as shown. Cover the wing case with a thin coat of 5 minute epoxy. 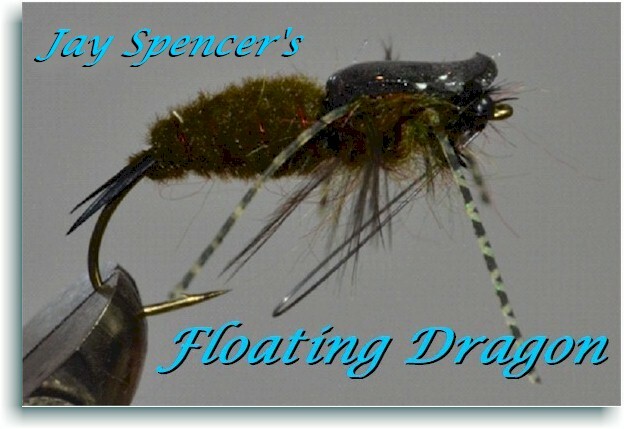 This entry was posted in Authors, Hot Flies, Jay Spenser's Floating Dragon. Bookmark the permalink.